Vinegar has been consumed as a tonic in many cultures for centuries. Here in America, so-called "drinking" vinegar is making a comeback! Savvy bartenders are using them in cocktail recipes while others are enjoying them (alcohol free) as a refreshing mid-day beverage. 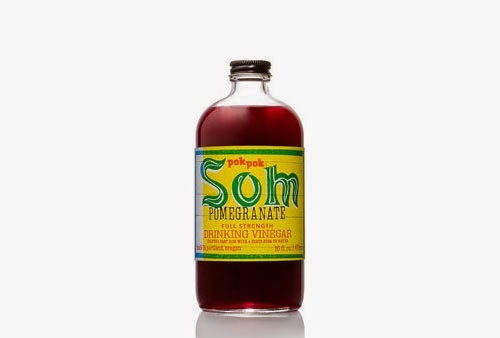 Pok Pok Som is made in Portland, and works as a delicious introduction to drinking vinegar. We carry three flavors: Thai Basil, Ginger, and Pomegranate. These vinegars are very concentrated, so a little goes a long way. Come try a bottle! We've been carrying Jacobsen's local sea salt for a few months now and have heard great reviews from customers. So we're adding to our selection. Three new flavors you'll see on our shelves are Ghost Chili Pepper, Stumptown Coffee, and Cherry Wood Smoked.